So I returned to the berry patch this past weekend. The patch that I discovered a week ago, and wrote in my previous post. This is where I saw all those big, plump, juicy looking, scrumptious appearing blackberries, that were inviting me to go in and indulge. 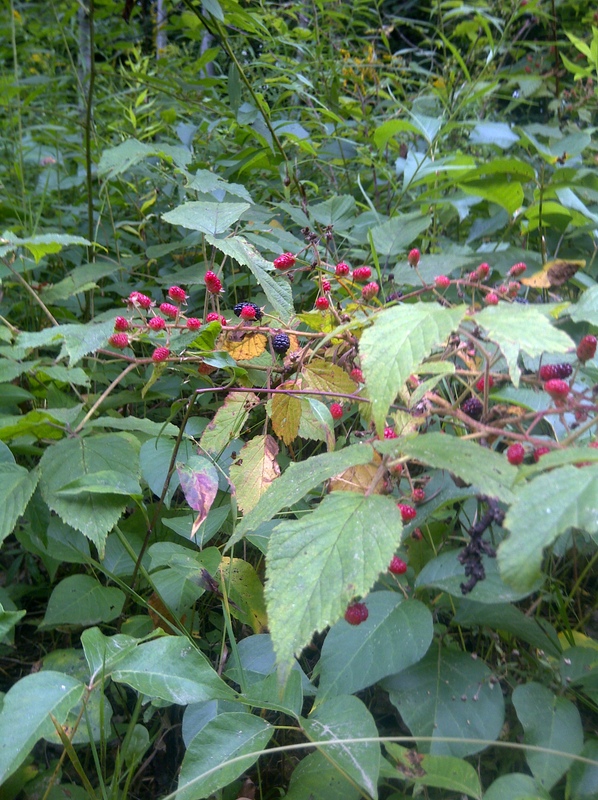 I ate 2 berries located within reach, at the edge of the trail, and just as I was about to jump into the patch and indulge, I saw something hiding in the brambles that stopped me in my tracks. I decided I would NOT take the chance to go in and pick these big, juicy blackberries. It just was not worth the risk! So I returned to that same berry patch, hoping, just hoping what I had seen the previous weekend had disappeared or had gone away. A flood of disappointment enveloped myself, when I saw it had not moved. It was still there. I had no backup, if I needed it, no weapons on me whatsoever. The big, plump, tasty looking blackberries were there, just like last week, but this time in even more abundance. Look closely, and you will find what I am afraid of hidden among the brambles! My heart was torn. I had been running again for an hour. The berries would provide much needed energy and fuel for me to keep running. I wanted those berries SO badly, but decided in the end, NOT to take the chance and go into the berry patch and indulge. What IS in that berry patch, that is keeping me from entering? Why am I so afraid? It will seem like a “Where is Waldo”? type of assignment, but believe it or not, you will find the thing I am afraid of, hiding amongst the brambles in the 3 pictures above. Leave your guesses of what YOU think it is. I will even try and up the ante, and offer a “prize” to the winning guess. No, I do not have a stash of cash hidden under my mattress, no, I can’t offer a trip to Vegas. After wracking my brain of what to offer as a prize, I have decided to drop by your blog 20 times over the next month of September. (every blogger loves blog traffic……right?????) 🙂 I will drop by your blog and write a nice encouraging comment on those posts I read. For some bloggers, this might be “the greatest prize in the world, like winning the lottery” (although I hardly think so….haha). Other bloggers might find the prize “okay……I guess”. And others, well, this prize might seem like “the worst prize EVER”. It is all a matter of perspective. And for those newer bloggers just starting out, who have less than 20 posts, I will stick with you, as you build your following. So here goes!!! 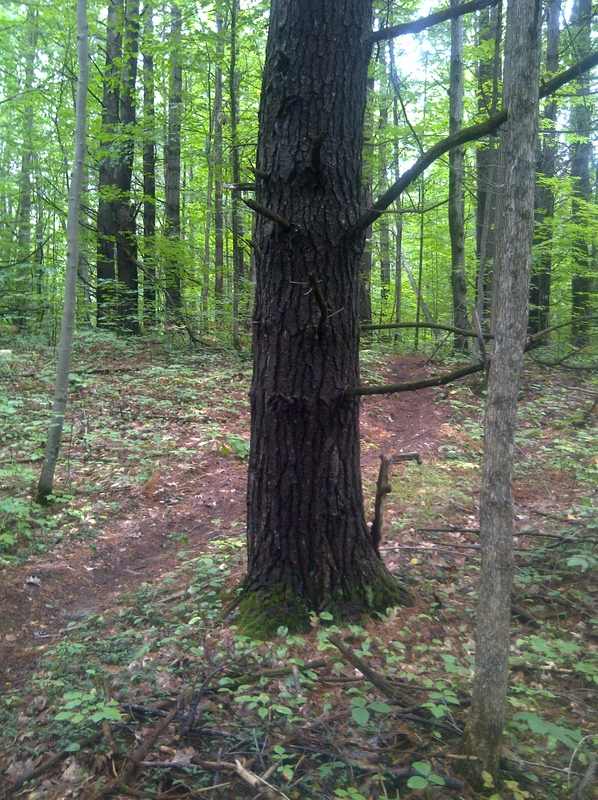 Away from the berry patch, a pix of my latest trail run. Haha….love your enthusiasm Barbara. This is an excellent guess. I tell you, I have NOT liked mice, ever since I was a kid. Back then I picked up a bale of hay on the farm, and about 5 of them scurried away. I must have jumped 3 feet, it startled me so much. I will not say if you are correct yet, but mice will hang around berry patches. 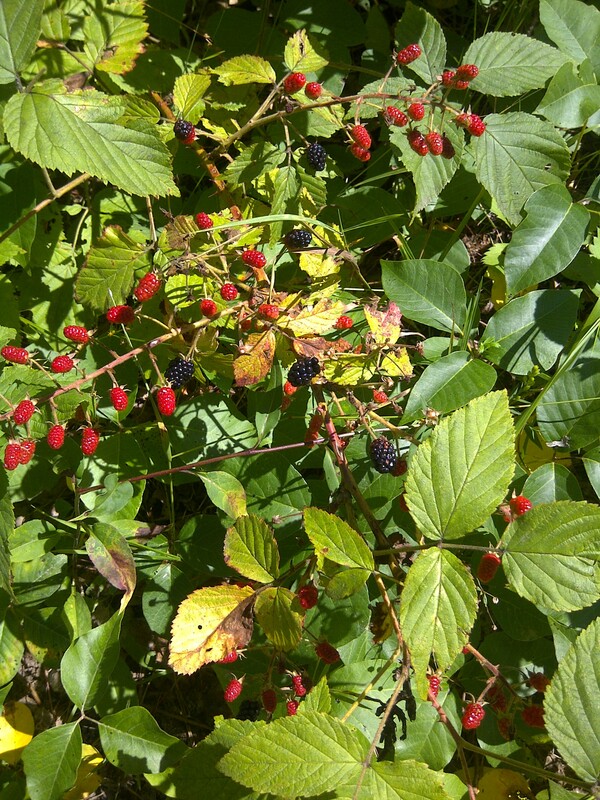 The ripe berries that fall to the ground are a food source for them. If there is one mouse, they will be many mice, and if there is food there, they will not leave. If I DID see a mouse in there, I would not enter the patch. Hi Carl! Is there poison ivy in there?? Sarah, thanks for playing, and wow, this is an excellent guess. Poison ivy has a tendency to grow along the edge of forests and fields, exactly the type of terrain where parts of my trail running takes place. I got poison ivy in my early teens. “Once bitten, twice shy”, if I even thought of a possibility of poison ivy in there, I would not go in. My dad was not angry with me that I got poison ivy as a teen, because I did not know what to look for. He took me for a walk to where there was a small patch, and gave me pointers of what to look for to identify it. I’m throwing spider out there only because I have one the size of a small cat living in my zucchini plants and I’m terrified to stick my hand in there. And I tell you, this is a GREAT guess. Spiders are very intelligent creatures. They will spin their webs to intercept the flight paths of insects. And there could not be a better place than a berry patch, where small bees and other insects will zero in on the overripe fruit, which is softer and easier for them to feed on. And your zucchini, where insects are attracted the flowers and fruit. I have bad memories of spiders. I was in water well drilling for 20 years, and in one cottage I was pulling a water line through a crawl space. There was just enough room for me to squeeze through, but the crawl space was full of spiders, and I exited with bites all over me. Guaranteed, if there was a spider the size of a small cat in there, I would not enter that patch…haha. And spiders once they have their trap set up, and is catching lots of food, they will not go away. I am amazed by these excellent comments. I will not say if your answer is correct, but will announce the winner later in the week. Karen, I LOVE your new gravator picture. And thank you for playing. You gave a great guess on the poison ivy. But don’t discard the snakes. Where there are mice, there is a VERY good chance you also find snakes (all part of the food chain)….LOL. Interesting enough, snakes don’t bother me. I haven’t had any experiences that have given me the “creepies” like I have had with spiders. If I did see a snake in there, I would not want to spook it and scare it away. I would want it to remain there, and take care of the mice (which I am afraid of)….haha!! With the poison ivy, it must be very unnerving that you are highly allergic to it. Thank you so much, Carl! What a coincidence this is, but we just got a frantic call from a friend…there was a huge black snake on her screened in porch, and her dog was going nuts. Her & I were inside screaming and jumping around while my husband removed the snake. Who says there’s anything rational about fear?!?! Wow, this is incredible Karen! I can imagine the snakes that frequent your southern states are FAR different from the ones we have in Central Canada. The snakes we have here are pretty much harmless, and I have never been around a threatening snake…..ever. I have to be very sensitive that I don’t get too “overjoyed” with my wife around, when I see a snake in my garden. (I am honestly happy to see them, because they are quite beneficial). Yet here I am, ghastly afraid of spiders……it just does not make sense. My wife on the other hand has a very justified fear of snakes. She spent her 1st 9 years in Southern India, and the boys used to torment her, by chasing her with poisonous snakes on the end of sticks. When I tell her that I saw a snake in the garden, just to let her know, she will not go near it. I have to respect her, because this fear is very real, and very justified. Thank you for sharing Karen. I sincerely hope everyone is okay! Oh my goodness, just hearing about that makes me want to pass out! Yeah Karen, pretty intense what those boys did to her, and how it has affected her throughout her entire life! In your opening lines I thought it had to be a snake which would be reasonably typical of Tasmanian Blackberry tangles, but as you continued to write the ‘monster’ seemed like it was something else. So I looked at the photos and it seems there are two plants; the blackberry and another which I can’t identify – I wondered if the other plant was toxic to the touch or had some other nasty hold on a person passing by. But it looks safe enough in the photos (of course). I would never go into a blackberry bush because of all the thorns which rip your body and clothes – but your blackberry canes seem smooth so that can’t be it. There could be a bee in there but if so, unless you are allergic, the chances of being stung are minimal. If it was a wasp then that would stop me in my tracks and I would move away – they are nasty critters in my experience. The only other thing that I thought I saw was a bit of a feral cat – now that would be scary to a point – but ferals will run away and so you would be free to enter the prickly throng (if in fact your blackberries are prickly). So in the end I am at a loss and can’t wait until the next exciting episode when all is revealed. I absolutely LOVE your response, and how you process going through different possibilities. It is easy to see through your answer, how keenly attuned and aware you would be in natural surroundings. Tasmania and Canada would be quite different in our plant and animal species, but it is always fascinating of what we have in common. The main subject is the blackberry brambles which we have in common. I have been scratched by the thorns in times past, and the berries have always won out…LOL. I will indulge with the risk of getting scratched. We both have snakes, though the ones in my area are non poisonous. We do have a rattlesnake in my province, which is endangered and a protected specie. It’s range at one time used to include this area, but no more. In the times I have gone hiking where it has been known to be found, I never saw any. I am sure our bees and wasps are quite similar. I got 2 wasp stings just yesterday, in which I disturbed a wasp nest, which incredibly was an in ground nest on someone’s lawn. A wasp nest is an EXCELLENT answer. I would not enter that blackberry patch with a wasp nest in there, and it certainly would not simply disappear on it’s own. Forget the prize, forget the puzzle. You write an excellent provoking story – love it! … But I would really value a contribution to my blog from time to time as a commenter or even if you’d like to write a piece – you light the day for me on a miserable Monday morning. Could it be a little maggot, a harmless bit of protein to one whose stomach has been hardened in Africa? Awww, Jane, thank you. Your answer is REALLY good. Maggots are something that feed on the flesh of something dead. Wow…this is pretty intense…..haha! If there was something dead in that berry patch, I would definitely NOT be entering it! Would the dead “something” still be there in a week’s time, or would the maggots make it disappear, through their scavenging????? Stay tuned Jane till the end of the week, to see if your answer was correct. Haha, Carl, this has got me thinking. Something that hasn’t moved in a week (?) and something you’re not particularly fond of… Was it a snake skin? I’d bolt if I saw that, knowing the actual snake could be somewhere close! Looking forward to reading the correct answer when you post it! Wow, Celia, you are very perceptive. How did you know that I do not “embrace” snake skins? I actually do not mind living, breathing snakes. The snakes up where I live are quite harmless, and am happy if they take up residence in the garden. We had a pretty bad mole problem one year that made a huge mess on our lawn. At least 2 gartner snakes moved in, and “took care of the mole problem”. Just like that! Snakes are so beneficial, by keeping the balance of nature in check. But the skins, give me the “willies” Celia, I don’t know why. Strange as it is, I have handled snakes before with my bare hands, but not snake skins. Very strange. A snakeskin would definitely deter me from entering the berry patch. Haha how can you like snakes, but not the skins?! Snakes definitely have their uses, but growing up in the countryside I had too many close encounters for my liking! The snakes we have here, are SO different from what you would have experienced in your former homeland of Northern Queensland. There certainly would be no comparison to my cute, beloved adorable Gartner snakes, which ate mice and moles, and your Pythons and Taipans, which could “wolf’ down a juvenile kangaroo. There is a HUGE difference, and I respect you for your feelings. I would be in HUGE trouble if I ever visit Australia. I’ll be saying “Ahhh, look at the nice snake”, and meanwhile it is a mulga, with enough venom to drop a water buffalo…..haha. Poison Ivy was my first guess, but I’ll go with poison oak since poison ivy has already been mentioned. I think poison oak is more rare in your area than poison ivy. And sumac is even more rare, I think, or I might have chosen it instead. It is very evident that you are well versed with the flora in my area. Poison oak is around, and as you mentioned, it is indeed more rare. I am not even sure if I could identify the poison sumac. There are a few patches of the (non-poisonous) staghorn sumac in the area. I love the intense reds they become in the fall. Also how the birds congregate, to feed on the fruit. A bear is a GREAT answer. From about this time on, bears are preparing themselves for their annual hibernation. 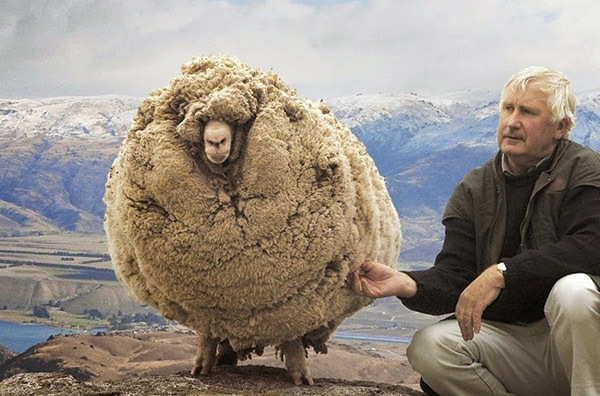 In order for them to get through those several months without eating, they pack on extra weight now. Food would be constantly on their mind, and they will return time and time again to sources of food (like a berry patch). Carl – Great post! I love how everyone is intrigued by this “mystery monster” hiding in the blackberry patch. I know it has been mentioned already but I would have to guess that it’s poison ivy – huge scary leaves. Enjoying this post and reading everyone’s interesting guesses and your equally interesting responses has been a pleasure. Thanks for visiting my blog from time to time. You are always so positive! Awww…Mar! THANK YOU! Your kind words really touched my heart. Every guess given, has been such a great guess. Any of these choices, could be the very thing that would keep me from entering that blackberry patch. Just a few more days, until the winning answer and the winner will be announced. Thank you so much Mar, for dropping by, and playing. Ok, I even zoomed the picture and couldn’t tell. Nothing. Nope. Not a thing. I don’t know what any poisonous plants look like, so if it was one of those I would be stumped. I even got a coffee for this one. Hahaha. Anyhow, so you’re a runner. I run too, but not long distances. I have to tell you that I’m jealous of your blackberries though. I love blackberries and raspberries, but can’t get them where I live. I was born and raised in Vancouver, Canada, but have been living in Brazil for the past 13 years. Great post Carl, and nice to meet you. Blackberries and raspberries would be something that really would be missed, if you remember them, but do not get them where you now live. I was talking to a person visiting from the Caribbean recently at a birthday celebration. She passed on all the items such as pineapples (where she gets in her homeland), but had a piece of raspberry pie. Absolutely LOVED it. Thanks for sharing a little bit about yourself. So very cool, you are also a fellow runner. Brazil would be such an incredibly fascinating country to be living. Huge cities such as Sao Paul0 and Rio de Janeiro, but also that vast amazon rainforest. AMAZING! Hahaha. Yes, coffee is magic for times like these. I get back to Canada every couple of years and I always make sure I have raspberries and blackberries. My mom buys them frozen (I normally go there for Christmas so it’s winter time). I make smoothies and stuff. Yes, I’m a fitness buff. I’m certified in fitness and nutrition. Used to teach. Now I work out just for my health and to not get fat. I do a lot of HIIT, but still run a bit everyday before my training. Yes, I’ve been to both Rio and Sao Paulo. Never to the Amazon. I’m living close to Belo Horizonte. Will be going to Rio for an arts conference on the 22nd of this month. Can’t wait. The HIIT has got to be an incredible workout. It would take an incredible amount of disciple to keep going. Just yesterday, I was out cycling with my niece on a local rail trail, and way in the distance on this bridge over a river, I saw a person jumping very seriously high. Was she trying to signal us for help? Then it dawned on me, she was doing jumping squats. Sure enough, as we crossed the bridge, she had her music playing, and was onto another part of her training. It was such a beautiful spot at this location, and I admired her, for her self confidence to feel comfortable to do her workout here. But was really amazed how intense this workout is. I really commend you for your discipline. Oh yes, it’s great going home. I don’t really like all the cold, but it’s great seeing my family and having a Canadian Christmas (which is very different than a Brazilian Christmas). Oh yes, HIIT. The good thing about it is that a regular HIIT workout goes no longer than 20 minutes. Gotta like that when you’re limited on time. Have a great week Carl. I guess you did indulge! Well just for a bit any way. Even though you’ve already written the next post with the announced winner I”m going to guess poison ivy. Hi Tricia, I did indeed indulge a little bit (but in a nearby “safe” patch).. I guess I have not mentioned the winning answer yet. Boy, it has been tricky skirting the correct answer, until that most recent post was published. And all the participants had such great answers, which were real possibilities. My next post will have pointers of what to look for as to how to positively identify poison ivy. 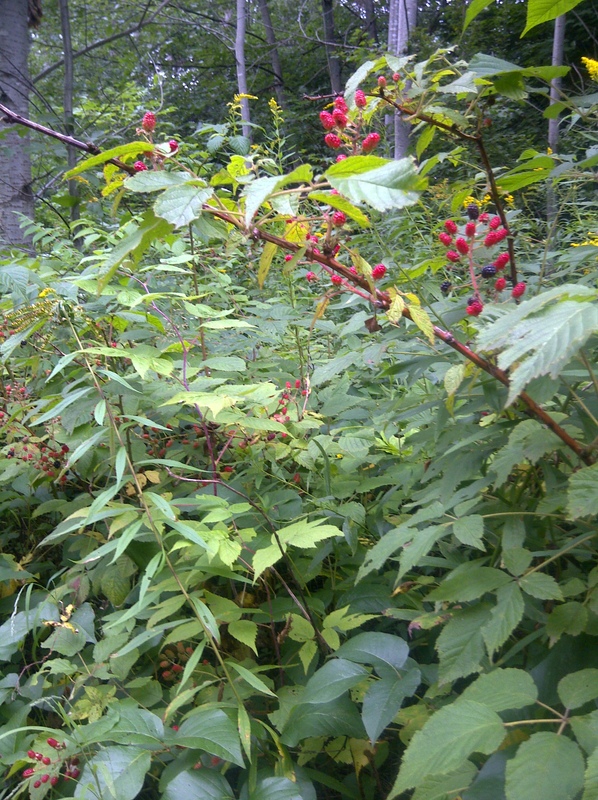 That berry patch was FULL of poison ivy. If anyone entered that berry patch to pick berries, their skin would have been an awful mess in a few days! Good, I look forward to your next post because I hate poison ivy and will appreciate your tips! I prefer cash. =) As to the photo size: now THAT’s what I’m talkin’ about!! Haha, cash is definitely good. 🙂 The pictures took me a LOOOOONG time to finally figure out. Am working my way through old posts as time allows to edit the pictures bigger. Am still learning other stuff, but have much more to learn…haha. Here in the Big Sur area, we have more poison oak than people. It’s HORRIBLE because my 9-year-old is so allergic. This has got to be so difficult April. We have some poison oak, but much more poison ivy. I know way back when I was a 9 year old boy, the last thing on my mind was to be on the look out fir poison ivy or poison oak. I just wanted to explore. Hi Carl! It’s got to be poison ivy, right!??? I’d be torn in two directions as well! Enjoy the day….It’s a holiday here (Labor Day)! Hi Daniel, you are absolutely right, it certainly is poison ivy! Wrote the post 2 years ago. Lately the berries are back out and I run right past this patch in my training. Thought I would share it again on my Twitter! ohh. the suspense! I have zoomed in and don’t see any danger lurking there. I can only assume that one of the plants must be toxic? Poison oak or poison ivy? As a trail runner wannabe, I really should learn to identify these plants. Thank you so much for visiting Diane. You are exactly correct. It is poison ivy my friend. After seeing a group of younger hikers not knowing walk right through a poison ivy patch I wrote this article 2 years ago as a part of a fun mini series to hopefully help people identify it. There is a lot of poison ivy around where I live. It is very frightening with how toxic it is.